For a launch event that was teased for a month, first slated for San Francisco, then moved to Universal Studios, Los Angeles, on a Friday night before Halloween weekend, Elon Musk's solar roof pitch ended in a flash with no hard questions answered. Yes, the solar shingles look pretty. They come dressed up as French slate and Tuscan clay tiles, and through clever manufacturing they don't even look like solar cells when viewed from a low angle. And yes, Musk released the most elementary details about the new Powerwall 2.0. But he failed to address any of the serious, foundational challenges facing a car-company-turned-battery-and-solar-installer that wants to get a roof product to market. "The goal is to have solar roofs that look better than a normal roof, generate electricity, last longer, have better insulation and have a lower installed cost than the price of a roof plus the price of electricity," Musk said, getting as close to discussing relevant pricing specifications as he ever came in the short public briefing. Before revealing the shingles, Musk noted that the Powerwall 2.0 will start at $5,500 with 7 kilowatts of power capacity and 14 kilowatt-hours of energy storage, twice as much energy as the previous model. That capacity is much better suited to the needs of a typical American household, noted Ravi Manghani, GTM Research's director of energy storage. This model also surpasses the capacity of the 10-kilowatt-hour model that Tesla surreptitiously discontinued earlier this year. In a blog post Thursday, Tesla declared it has been shipping an updated version of its utility-scale Powerpack batteries since September. The company boasts the new version has twice the energy density as the first model and a newly integrated, house-made inverter that is "the lowest cost, highest efficiency and highest power density utility-scale inverter on the market." Including the inverter should indeed simplify installation and generate cost savings. The post added that 300 megawatt-hours of Tesla batteries have been deployed in 18 countries. Musk chose not to mention whether the new Powerwall similarly integrates an inverter, so that customers don't need to have another piece of hardware installed to actually use the battery. The company website later confirmed this does come with the new Powerwall, which is certainly an improvement. This also makes the Powerwall 2 about 40 percent cheaper based on energy capacity than its predecessor, which cost about $4,500 including an inverter for 6.4 kilowatt-hours. 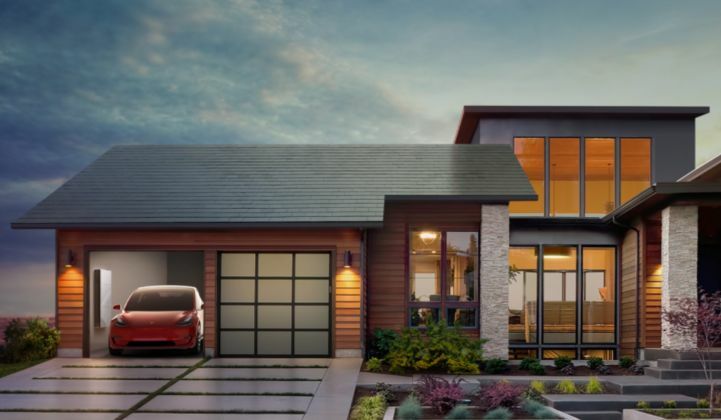 The following are some complexities of the solar roof market that a chief executive might choose to address were she diligently trying to sell a new product in this difficult, nascent industry. First Tesla made electric cars. Then it added home storage systems to charge those cars. Now it's trying to acquire SolarCity to sell the rooftop panels to charge those batteries. On top of that, the combined companies want to sell roofs that are solar panels. The value proposition for solar integrated roofs is that they turn sunlight into electricity while looking just like a roof. That means no metal and glass boxes sticking up into the air, marring an otherwise beautiful array of asphalt shingles, most of which aren't visible from the ground to begin with. The shingles Musk touted do succeed at this. He demonstrated several different styles of shingle, showcasing a range of aesthetics and colors. The French slate model, he noted, uses hydrographic printing to make each shingle a totally unique "special-snowflake tile." The coloring looks varied and weathered, and admittedly beautiful. Customers fed up by "messy" installs by solar lease companies are starting to crave the elegance of solar integrated roofs for their homes, explained Oliver Koehler, CEO of solar roof company SunTegra, in an interview earlier Friday. SunTegra, founded in 2013, courts the new-roof and re-roof market, which lets it leverage cost savings: you don't have to pay for a new roof and then solar, and you don't have to pay to take off the solar array when you replace a roof later on. It's still more expensive than conventional PV, but most customers are willing to pay a 10 percent to 20 percent premium for the better aesthetics of the integrated roof, Koehler said. As for the field of competition for Tesla-SolarCity, it's slightly larger than the crowd of SolarCity suitors. Many a company has failed in this realm, most recently Dow Chemical Company, which shuttered its Powerhouse solar roof line this summer. That product relied on expensive and underperforming copper-indium-gallium-selenide (CIGS) technology, and shouldn't be generalized to portend doom for all solar roofs. Remaining solar roofers include Michigan-based startup Luma Resources, CertainTeed's Apollo product, and some other small firms. (Eric Wesoff offers up a more complete list here, along with the names of the fallen.) Koehler estimates that solar roofs account for 1 to 2 megawatts of installed capacity so far. SunTegra's done 50 installs, so it's safe to say this is still a growth market. "There hasn’t been a runaway commercial success here, but that doesn’t mean the potential’s not there," he said. "It is hard, and you have to pay attention to the cost side and your channels to market." There's a market for new roofs -- 5 million a year in the U.S., as SolarCity's Lyndon Rive has pointed out. But people don't buy roofs from solar installers. Solar companies don't come with the expertise to install watertight roofs, so the product will require partnering with a new cast of companies from the roofing and homebuilder industry. Musk did not touch the question of what channels he would leverage to get the shingles to customers. "You're looking to drive a completely new type of product through the very conservative roofing channel -- and that's a daunting marketing challenge," as GTM's Wesoff described it previously on our site. This also poses a challenge for SolarCity's sales team, which will have to market a very different product. Selling no-money-down leases on solar modules that slip onto your house and start saving you power immediately is one thing; selling an entirely new roof to developers or homeowners is another. "They go in and they sell savings on your bill," Koehler said. "They like to sell the same thing time and time again. [...] They might trot out an interesting product, but how they integrate it into what they’re doing is going to be tricky." In particular, the company will have to convince people that they should entrust something as fundamentally crucial as shelter from the elements to a brand new product from a Silicon Valley startup. There's enough reason to pause before updating your iPhone software, to allow time for the kinks to be worked out. But what if that brand-new product was the one thing standing between your family and a thunderstorm. Would you be the first to give it a try? Once SolarCity finds a team of laborers to actually install the shingles and some eager adopters willing to gamble the integrity of their homes, all the questions of the actual solar performance come into play. Building-integrated photovoltaics have traditionally suffered from costing more and operating less efficiently than conventional PV. Elon did not deem it relevant to mention the efficiency of SolarCity's product or how much it costs. Presumably those are things a customer might want to know. Elon checked one box of his stated goal -- the shingles do look better than a typical roof. The rest of the claims are still up in the air. It's bizarre to tease a product launch for so long and then have so little to show for it. It's also bizarre to schedule such an event at a time when Californians are heading home from the work week and East Coasters are already kicking back for the weekend. On a grander level, this is a strange time to launch a whole new, mostly unexplained product. Shareholders are voting on the Tesla and SolarCity merger on November 17. As Teslarati put it before the event, "Friday’s upcoming announcement offers Tesla an opportune platform as it attempts to persuade shareholders that the merger has sound financial merit." If shareholders were looking for a business strategy or a product launch timeline, they came away with less confidence than they started with. Many critics of the merger have pointed out that Tesla has its work cut out just scaling its car and battery production to meet company goals and consumer demand. The hard work of merging two very different companies distracts from that, as does launching tangentially related product lines with most of the details still up in the air. Tesla's announcement last week that all cars in production will be equipped with hardware for full autonomy was pretty cool. The company followed that up this week with a surprisingly strong earnings call with an unexpected profit in the latest quarter. The recent revelation that SolarCity wants to bring in Panasonic for PV manufacturing, potentially sidelining the company's much-touted in-house Silevo PV technology, was more of a cause for concern. All of which is to say that Tesla wasn't in dire need of making headlines at this moment. Headlines, though, were about all the company delivered today.